Our Pectin shell heishi beads are the finest that an artist could ever ask for. These beads are natural and the Pectin sea shell used to make them are hand picked from the beautiful beaches of the Philippines. Two sided. They are drilled through the center, length ways. size per bead is 15mm x 13mm x 5mm. 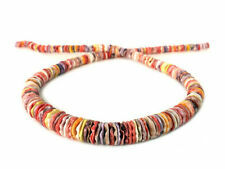 Natural Orange Yellow Purple White Pecten Shell 5-6mm Heishi Beads 24". Size Approx : 10mm. - Thickness : 10mm. - Mosaics Round Bead Handmade. - NaturalAbalone Shell with Fine Polished. - 1mm Hole Drilled Vertically. - Creative shape for design use. Colors can include green, blue, orange, white, red and more. Shapes can include drilled and undrilled teardrop, flat round, donut, leaf, diamond and more. Drop / link / button mix, mother-of-pearl shell (natural / dyed / bleached), mixed colors, 10x10mm-34x28mm mixed shape, Mohs hardness 3-1/2. Size Approx : 12mm. - Thickness : 12mm. - Mosaics Round Bead Handmade. - NaturalAbalone Shell with Fine Polished. - 1mm Hole Drilled Vertically. - Creative shape for design use. Quantity: 1 Strand. Beads Size : 8mm. Style : Loose Beads. Colors may appear different on each computer monitor. Most issues can be resolved with simple communication. length: 15". Inlaid with Clear Epoxy Coated Paua Abalone Sea Shell. The 1mm holes in these beads are 8mm apart. Size Approx : 8mm. - Thickness : 8mm. - Mosaics Round Bead Handmade. - NaturalAbalone Shell with Fine Polished. - 1mm Hole Drilled Vertically. - Creative shape for design use. 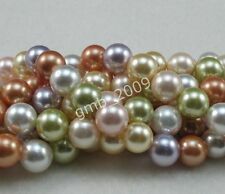 Multi-Color Pectin Shell Heishi 10m m Beads 16” long natural color, g enuine shell. Purchasing Natural Orange Purple White Pi k Yellow Pectin Shell 10mm X 1mm Disc Beads. Miniature Fairy Garden Turquoise Chips Gravel Dimensions (approximate):​ ​ 8 oz. of 5mm to 10mm shells. Material/Use:​ Dyed shell and suitable for indoor/outdoor displays. S811 Tiger Nassa Shell End-Drilled 7mm - 12mm Natural Gemstone Beads 36"
Nassa Shells. Color: Brown & White Tiger Shell. Shell Beads. Intriguingly unusual shell beads imported from the. Shell strands can range from light to dark. Be Dazzlin Beads. Approximate Hole Size: 1mm. Other: Mother of Pearl, Chip, Permantley Dyed. Mother Of Pearl. Color: Jewel Colors. Hole: Approx 0.8MM. MP1852 Abalone Shell Natural Blue Green 12mm Flat Oval Gemstone Beads 15"
California, Japan & New Zealand. 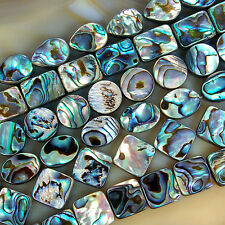 Gemstone: Beautiful Abalone Shell Beads. Abalone shell is found along the coasts of. Shape: Flat Oval Beads. Shell Beads. Be Dazzlin Beads. Color: Blue/Green with Natural Dark Markings. Genuine dyed mother of pearl. Loose Beads. MOP Chip and Pebble Beads. Howdy from Texas! Flat squarish shape. Genuine dyed mother of pearl. Lovely Small Abalone Shell Beads. 36" strand,Varied sizes of freeform beads Approx. 5x8MM and 3MM thick. Beautiful Sheen, colors from blues to rose hues. wear this long strand just as it is, Single or putting three together makes a gorgeous multi-strand necklace, or as. Tan Mother Of Pearl Shell Flat Round Beads 1 strand. Color is as pictured. Amazing shell beads with zebra stripes on them. Use them to make a long necklace wearing over clothes. Can easily match clothes. Colorful Shell Beads. Genuine shell, coated. Loose Beads. Standard size drill hole. Paua Abalone Shell Bead. You receive 1 of these shells drilled end to end. Natural Orange Purple White Pecten Shell 8mm Heishi Beads 16". They are drilled through the center, side to side. size per bead is 10mm x 10mm x 4mm. They are drilled through the center, length ways. size per bead is 14mm x 10mm x 5mm. 25 Mother Of Pearl Orange Yellow Gold Chunky Craft Jewelry Beads. Shipped with USPS First Class Package. One side is top of very colorful natural shell - reverse is natural "Shiva Eye" pattern Cane be used on either side. ~~Double sided~~~. Natural shell in varying shades of orange, green, gold, white reverse pinkish white, brown. This shows a woman with a hat on, wearing a Pearl Necklace. These are all hand carved and you will receive one just like this, maybe a little darker or lighter, but the colors will be there and beautiful. Matte multicolor shell pearl round beads. This strand is 16" long, about 12mm in diameter. Item:Cultured Star Pearl. Quantity: 1 - 16" strand. Shape: Star, attached to pearl. At Rock Candy our goal is to ensure that you receive high quality jewelry supplies at competitive prices. Our focal beads are hand-selected to ensure consistent quality. This group of glass beads is mostly from China, we think. They are from importers from China and from India. I will give you the best information I can. ~MOTHER OF PEARL~16" Strand Mixed Shapes, Colors& Sizes~Great 4 JEWELRY Making! One large Paua Abalone Shell Bead. You receive 1 of these shells drilled end to end. These are Natural Abalone shell beads. They are smooth and nicely polished. Incldues one strand. Just like all the colors of almost any shell you see with all the iridescent colors in the spectrum. These pictures really do not do justice to all the Colors that these have. I have several different settings these will fit in. 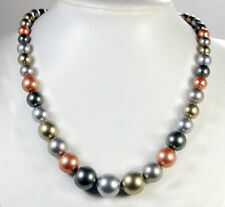 8-16mm Multi-Color Shell Pearl Necklace 18-20"
8/10/12/14mm Natural Multicolor South Sea Shell Pearl Round Gems Loose Beads 15"
Vtg Estate Natural Ocean Sea Shell Long Necklace Hand Made -35.0 inc Long #247.